The 13th annual Southern African Energy Efficiency Confederation (SAEE) Conference took place from the 13thto the 14th November at Emperors Palace Convention centre in Ekurhuleni, South Africa. The Conference brings together and serves the energy management-, environmental-, facilities building upgrades-, energy engineering-, power generation-, and efficiency improvement industries. Sponsored by the NCPC, EWSETA and Cova Advisory, the event is an important energy event of national scope for end-users and energy professionals in all areas of the energy field. The event is the one truly comprehensive forum where delegates access new technologies, regulatory developments and industry trends to shape the critical decisions for our energy and economic future. 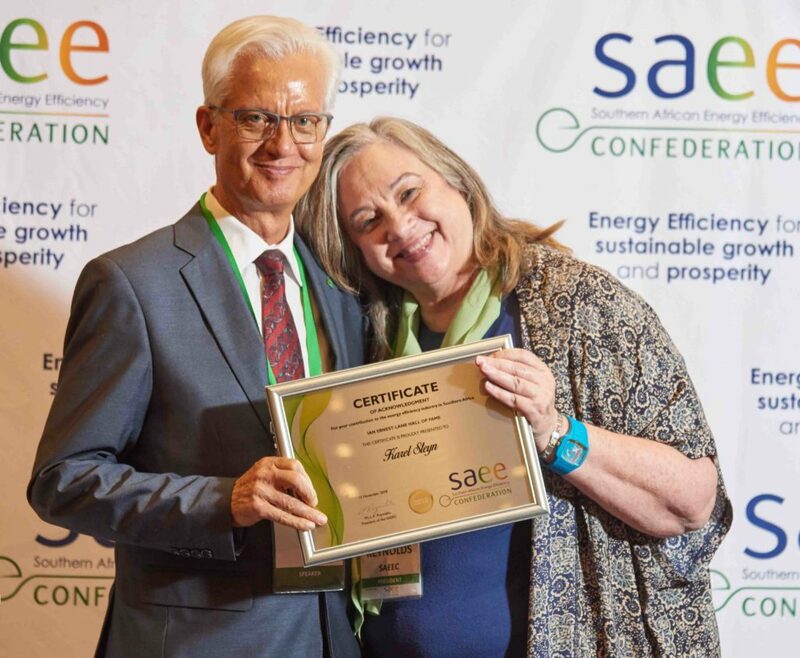 A highlight at the Conference is the SAEEC Energy Awards Ceremony held on the opening evening. The awards program recognises outstanding accomplishments of individuals and companies in the industry shining light on the important work being done in energy in South Africa. Energy Manager Professional of the Year for 2018 was awarded to a champion in the industry. With 13 years experience conducting over 140 energy audits and training over 1100 engineers around the world Albert Williams is a worthy recipient. The prestigious Energy Services Company of the Year went to Nelson Mandela Bay based company IDM Solutions who has saved SPAR Eastern Cape R7.8 million to date on energy costs through their energy saving mechanisms. Netcare Hospitals picked up two awards: Commercial Corporate Company of the Year and the Commercial Energy Project of the Year for their 63 energy saving projects and initiatives across the groups 55 hospitals resulting in the reduction of their carbon footprint by more than 16 000 tons of CO2 per year. Industrial Corporate Company of the Year was awarded to Supreme Springs who achieved over 60% water savings applying principles of CEM, having maintained and improved on energy savings consistently over the last 6 years. The Industrial Energy Project of the Year went to Groote Schuur Hospital who have reduced their coal consumption by 60% over the past 8 years thanks to their engineering departments adoption of energy saving practices. Two Dam Sustainable Partnership picked up the Innovative Project of the Year for their Net Zero Carbon certification, focus on renewable energy, improved water supply and utilization, alien clearing projects and waste management practices. Energy Innovator of the Year went to the outspoken Songo Didiza who founded the Green Building Design Group and has been instrumental in engaging both the private and public sectors for sustainable change in the Western Cape. Three Special Awards were also given. The Ian Ernest Hall of Fame was awarded to a past SAEEC President Karel Steyn (see attached photo). A Long Service in Energy Award was given to Prof. OD Dintchev who along with Karel Steyn has been a faithful pioneer and ambassador for the Energy landscape in South Africa. And a Special Legends of Energy Award was given to the lady who has been the back bone of the SAEEC over the past decade, Erika Kruger.